If you’ve been using the iTunes betas and want to downgrade back to a stable iTunes build, or you just want to remove iTunes for another reason, here are two ways to delete the app under Mac OS X 10.7: the easy way using the GUI, and a quick way for advanced users using the command line. Remember that without another version of iTunes available for Mac OS X to use, you will likely encounter errors in various places, plus it will make it impossible to sync and backup iOS hardware like an iPhone or iPad. Basically, if you don’t have a good reason to be removing iTunes, such as to downgrade or ditch the colorized version, than you should keep it around. As usual, be careful with the rm command because if you mistype the file path, you will delete other things without warning. This is why we recommend the command line for more advanced users only. No longer works. Please help. Thank for this method. I used de command line one, it works without any surprise!! Un grand merci pour cette méthode, j’ai utilisé celle de la ligne de commande. Voulez-vous que l’application “iTunes.app” accepte les connexions réseau entrantes ? No annoying message any more. Terminal method worked perfectly. Thanks! I did this and it worked perfectly except that when I launched iTunes 10.7 it could not read my iTunes library.itl file because it says it was made on a newer version and proceeds to download 11.0? Same thing happens to me! How do I address this? I need to get 10.7 back since the skin I have makes 11.0 text not visible. I followed each step of the “terminal-method”. If I want to delete the itunes-application with step three, I get a message in the terminal which asks for my password. But I can’t type it in. Can’t type anything in. Then I tried to delete itunes by dragging it to the trash, but am told that this is a component of Lion and can’t be deleted. Thing is: itunes 11.2, which came with Lion can’t manage my iphone 3G any longer. I’m getting rid of Apple! Do they expect that I will buy a new iphone just because I changed from Snow Leopard to Lion? 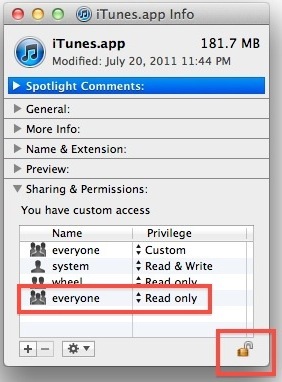 This does work to delete iTunes, you aren’t following the instructions. But given your comfort level with the Terminal I would strongly advise against trying to use the command line*, or any advanced feature, to remove iTunes. Please somebody code a visible on/off switch (you know, the sort of thing you found on a pre-war radio) that will stop bloody iTunes before it can intrude, but let me use it when I need it for work! « iPhone 5 Launch Date October 15, iCloud & iOS 5 on October 10?